It makes me wonder if it is the life changing event that is taking place in our life that’s making me twiddle my thumbs and raise my heart beat rate? Is it the excitement and nervousness that’s making me lose my sleep, and may be even my mind! I wanted to talk about it as there is no tomorrow, but it seems it’s not going to happen today! Hopefully the words will come to my mind and flow through my fingertips as they will tap and dance on the keyboard like those Irish dancers I saw few weeks ago. 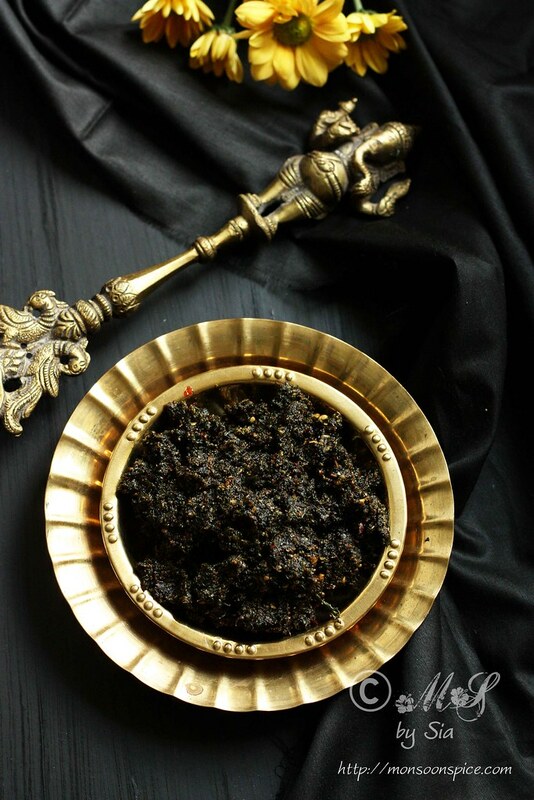 Since the words refuse to surface in my mind, I will share the recipe that I experimented few months ago and to my pleasant surprise it turned out to be one of best tasting chutneys. 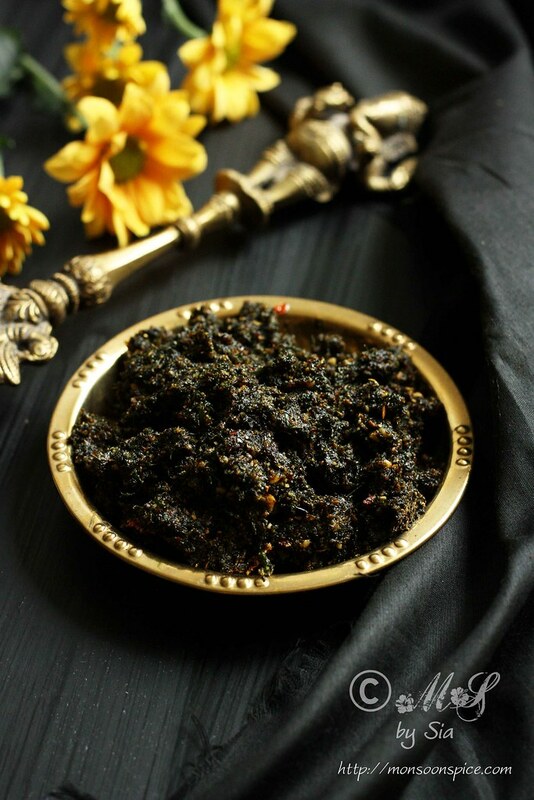 The recipe I am sharing today is Andhra styled Dill Chutney/Pickle. I don’t want to sound too shallow by praising myself for creating this, but I can’t seem to stop gushing about this super-hot and very tasty Dill Chutney/Pickle. Since this Spicy Dill Chutney was loved by everyone who tasted it, I decided to make it again so I can share it with you! 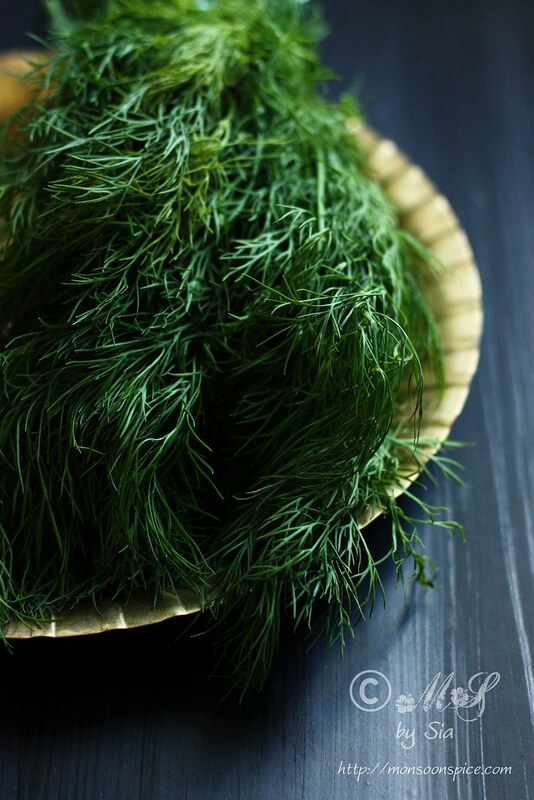 Wispy and fernlike Dill or Shepu or Sabbasige Soppu, as we call in Kannada, are very aromatic and has strong sweet flavour which is not to everyone’s liking. In the western countries, they are mainly used as flavouring the pickles, soups, salad dressing and fish dishes. 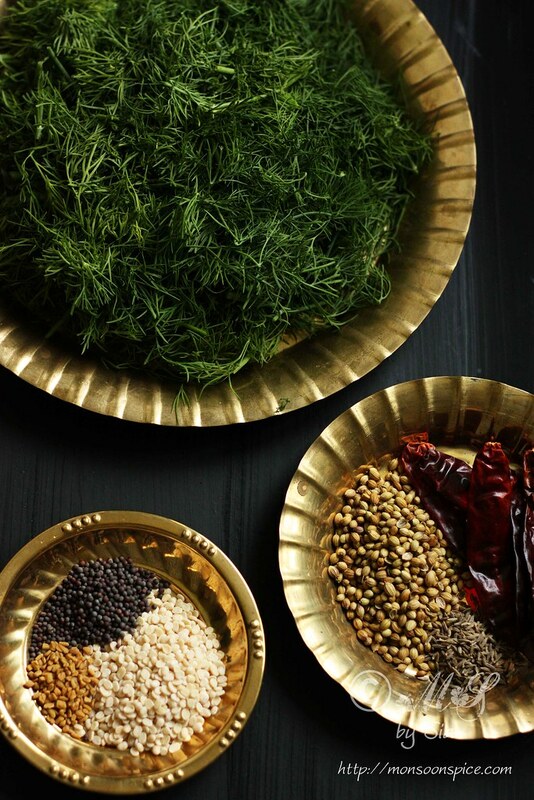 In India, the Dill leave finds its place in Dal (a lentil dish) and we use it widely in Karnataka when making chutney, saaru, palya and Akki Rotti (gluten-free rice flat bread). High in anti-oxidants and dietary fibres, Dill is really good example for disease preventing and health promoting herbs. 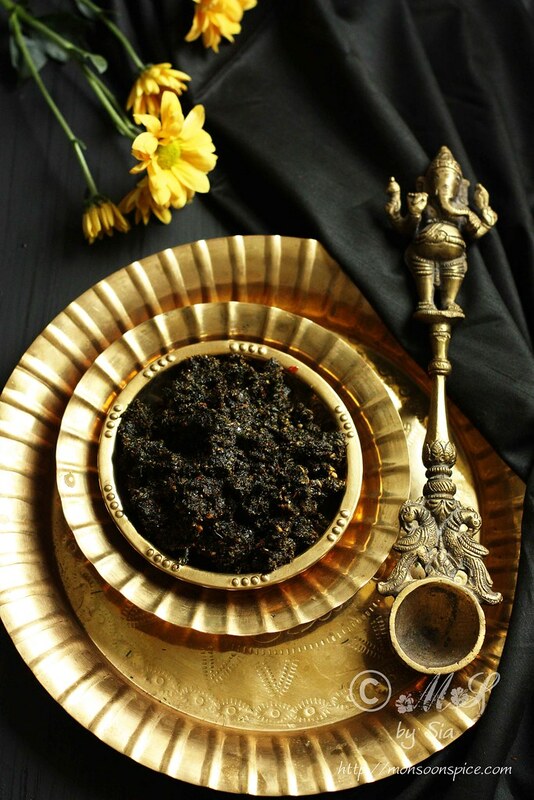 It helps in reducing the blood sugar levels, digestive aid and also help to control blood cholesterol levels. 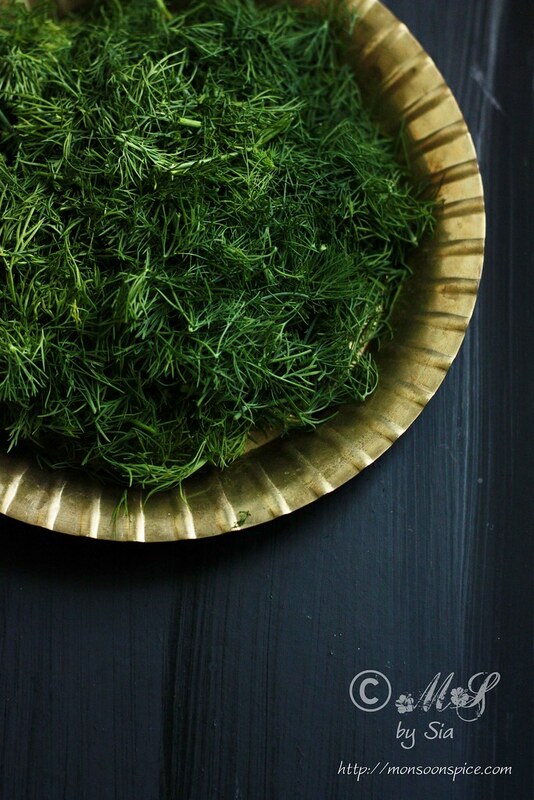 In India, Dill is traditionally given to new mothers immediately after birth to aid lactation. Heat 1 tbsp of oil in a pan and add coriander seeds, cumin seeds, fenugreek seeds, mustard seeds, urad dal, dry red chillies and hing. Slow roast the spices on low heat until the urad dal turns golden brown and the whole kitchen smells of heavenly! Take care not to burn the spices as the chutney will taste bitter! 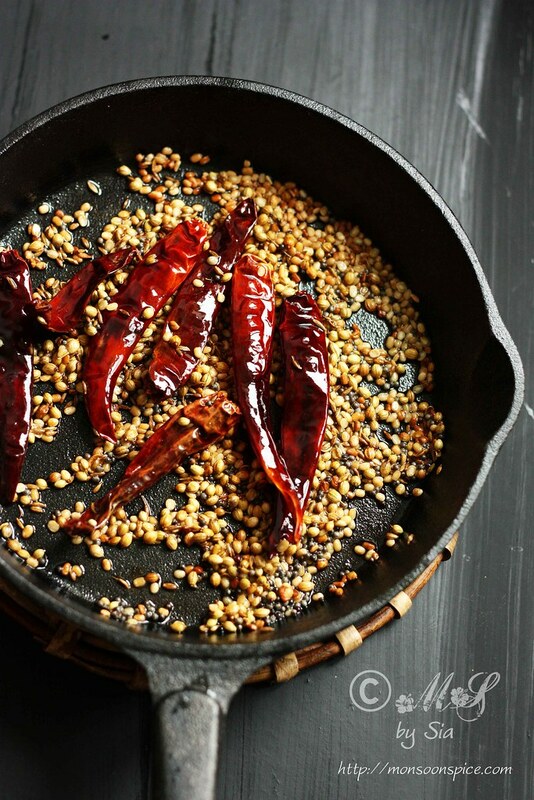 Spread the roasted spices to clean plate and let it cool down to room temperature. While the spices are cooling, add remaining 2 tbsp of oil to the same pan and mix in chopped dill leaves. 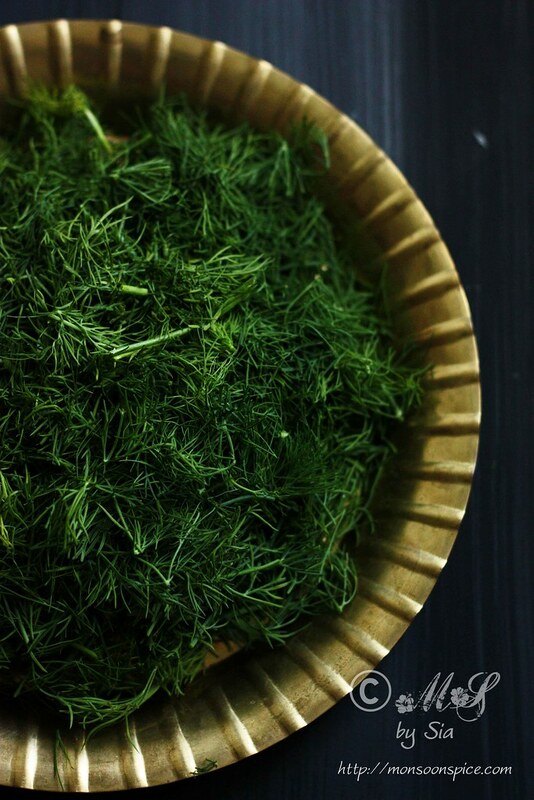 Fry the dill leaves on medium flame until their colour changes to deep shade of green, about 4-5 mins, on medium flame. Transfer the dill leaves and spread them on a clean, dry plate. Let them come to room temperature. 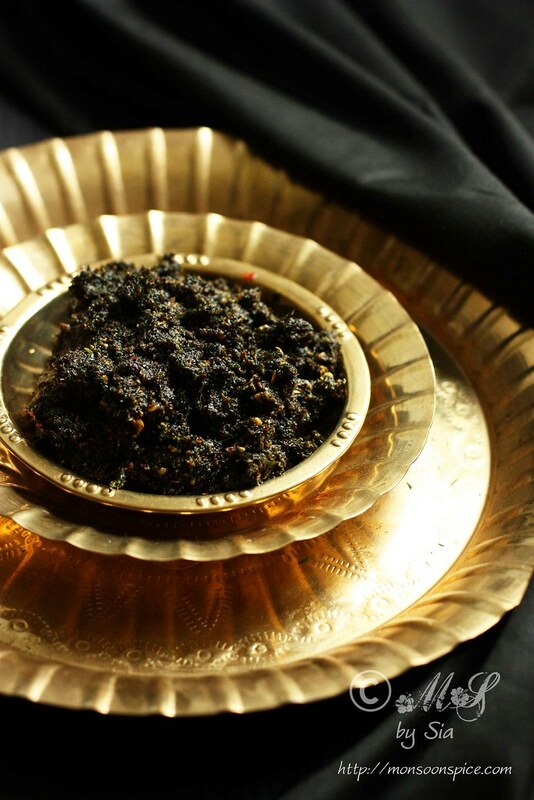 Grind the roasted spices to fine powder in a sturdy mixer-grinder or spice grinder. I use my trusty old Panasonic mixer grinder for this. 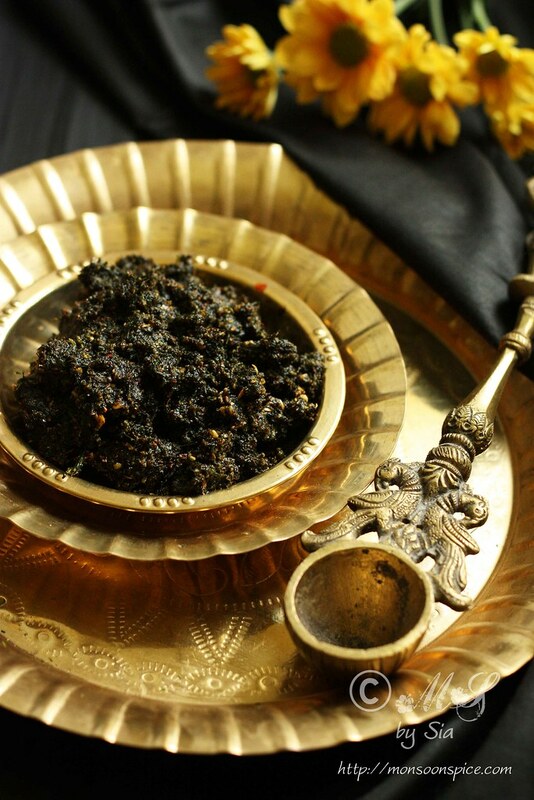 To this add tamarind pulp, powdered jaggary, salt to taste and dill leaves and grind them to form a paste. You will need to grind them in interval and make sure you scrape the mixture stuck to the inside of mixer jar. You need to get a rough paste as shown in the photograph. Transfer the Spicy Dill Chutney/Pickle to a clean, dry, sterilised, air tight jar and stock it in the refrigerator. You can easily store it for a month. Serve this delicious Spicy Dill Chutney with rice and dal or yogurt rice and enjoy! Wash the dill leaves and spread them on a kitchen towel to dry them as much as possible. I usually leave them on the kitchen counter top for 2-3 hours before chopping them to be used in making chutney. When roasting the spices, take care not to burn the spices as the chutney will taste bitter! So always roast them on the low heat. When grinding the spices and dill leaves, you may need to grind them in interval. Make sure you scrape the mixture stuck to the inside of mixer jar. You need to get a rough paste as shown in the photograph. You can store this Spicy Dill Chutney/Pickle for up to a month in refrigerator. You can serve it with rice and dal or with yogurt rice. It also goes well with dosa, idli and chapatti. You can also use it as a salad dressing, in rolls or as a spread for sandwich. Very interesting and original! This chutney is fabulous. Hey, you used the magic words: "convert others"! And also another magic word, "brown sugar." My husband and I love dill, but The Teenager thinks it's a torture food in the same evil league as bitter gourd. Which, for the record, I think may be the best vegetable ever. But then, what do moms know? Hmmm ... moms know to find recipes that include brown sugar and key words like "disguise." Bwahaha. Cheers from Nepal, where dill is known to most people as "saupf" and to my misinformed son as "AAAAAAK, not THAT!" Chutney looks delicious. Nice clicks. Nice recipe.. Will try it soon..
Wow, so delicious! I just made it for dinner, I am sure I will make it again!